A balloon-assisted UAV (Unmanned Aerial Vehicle) named “Phoenix-S1,” developed by Kyushu University and Fukuoka University, Japan, has successfully brought back stratospheric aerosol samples from an altitude of 22 km and observed aerosol density at an altitude of 23 km in Antarctica. The observation was performed as one of the summer activities of the 56th Japanese Antarctic Research Expedition (JARE-56). The leader of the expedition was Professor Yoshifumi Nogi of the National Institute of Polar Research. Phoenix-S1, after launch from observation site S17 on the Antarctic continent ice sheet, ascended while being suspended under a rubber balloon and performing aerosol density observation and sampling. After the natural burst of the balloon at an altitude of 23 km, the UAV descended with a parachute, then started gliding back to the surface autonomously by separating the parachute, and was successfully retrieved at S17. 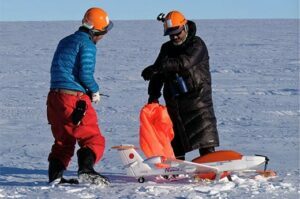 This observation method, combining a free balloon and an autonomously gliding UAV, was first introduced during the 54th Japanese Antarctic Research Expedition (JARE-54), and successfully performed observation and sample collection up to 10km in altitude. Phoenix-S1 has been developed to improve upon the UAV used in the JARE-54 so that it can cope with the more severe environmental conditions at higher altitude. The collected samples were brought back to Japan for electronic microscopic analyses to observe concentration and distribution of aerosols. This data will provide vital information on chemical circulation in the Earth’s atmosphere and its relationship with several current climatic issues such as global warming and ozone holes.